I don’t like it when things get complicated. The most eloquent ideas are usually the simplest. Even although this ‘kate flour’ seems to work, I’ve been uneasy about its formulation. Would we really have to work through each available flour from every different country, specifying by means of trial-and-error the best microwaving times for each and including consideration of all the different powers at which different microwaves function? On a scale of one to complicated, this seemed … well … intolerably complicated. Time to think again. How could I tell when the flour had been microwaved for long enough? I couldn’t think of a way of assessing its moisture content without knowing its starting moisture content, and waiting until it went black wasn’t really an option either. The only vaguely scientific-looking piece of equipment that I hadn’t yet used in my kitchen was a probe thermometer. So … water evaporation … temperature … I returned to my original Dove’s Farm pasta flour, heated it in the microwave for the time I already knew gave good results in baking and then took its temperature. I scoured my cupboards. 10 0z of McDougall’s 00 grade flour took 5 minutes to reach 138 degrees C. The same amount of McDougall’s plain flour reached 134 degrees C after 6 minutes. And then, just because it fell out of my cupboard when I squashed the plain flour back in, 10 oz of Francine’s bread flour took 7 minutes to reach 136 degrees C. Now I was running out of bowls if not flour, so I decided to start baking. First I turned each of my microwaved flours into ‘kate-flour’, substituting 1/8 of a cup with 1/2 oz of cornflour. I then made 3 Yellow Butter Cakes (thank you for the recipe, Rose 🙂 ), one for each of my ‘kate flours’. Guess what? They all worked! Yes, even the bread flour came in as a better alternative to bog-standard, unbleached plain flour. The plain four cake is on the top left, the bread flour cake on the top right and the 00 grade flour cake is on the centre at the bottom of this photo. For each flour, I weighed 10 0z and spread this on a pyrex plate (10″ diameter) to give a bed depth of between 18mm and 20mm. I microwaved the flour for 1 minute at a time at 750W. After each minute, I took a temperature reading and then stirred the flour to break up any lumps. I continued heating the flour by successive minutes until I obtained a reading that was at least 130 degrees C.
I removed the flour from the microwave and allowed it to cool to room temperature. I then sieved the flour and discarded any residue. I spooned the flour into a measuring cup (250 ml) and leveled the top with a palette knife. I weighed the flour in the measuring cup, then calculated 7/8 of this amount to obtain a weight for the flour component of 1 part of kate flour (10 0z of flour before microwaving generally yields at least 2 parts of kate flour). Uhh, I think i get it now. I will make cakes on Tuesday. Will take pics, too. oh this is sooo interesting…i’m actually in the US now, but will eventually be back in france, where i’ve been trying for years to get my american cake recipes to work. very nice that you’ve figured out the method, which should work for everyone everywhere it seems. brilliant! Thanks for your comment, susaninfrance 🙂 Would you be interested in helping to test out some of the French flours? It would be great to be able to collect information on the flours available there, too. I’m looking forward to hearing about your cakes, Melinda 🙂 . Is today the day? Kate and I are going to go out for celebration drinks sometime. Anyone else want to come along? Three cheers for Kate!… for she’s jolly good baker and say so all of us! In case my message doesn’t get through on Melinda’s blog ,(I did post there but I’m always unsure if I do things correctly!) I was really interested to read her results. I must try using a thermometer next time I try a recipe out to see if my cakes turn out even better! Also I will try other flours for the sake of baking science!! It is so nice to see how these experiments are going, you must feel very proud! The results of these experiments are really very exciting – I have to confess to being more in a permanent state of disbelief than in one of pride though! I keep waiting for someone to write and say, “It’s a load of rubbish – you’re dreaming”! Yay for Kate-Flour! We should all be calling it that! I will be breaking out my thermometer to guarantee I cooked the flour long enough. Thanks for being so gracious, and helpful! Your research is both fascinating and valuable! I live in Canada where cake flour is getting scarce. What we have is called “cake and pastry” flour, which is little more than plain all-purpose. Thanks to your work, I no longer have to fear the day when cake flour is no longer available at the supermarket. I’ve just found your blog and think it is amazing. I have always loved cakes, pastries etc but never had much success at baking anything. My cakes have always failed to rise or risen in the middle only and been a bit tough and to be honest vergin on leathery! I’d just about given up on baking another cake when last month I saw that someone mentioned The Cake Bible on Yahoo Answers. I thought that it sounded good and so I’ve just bought a copy. I’d heard the old adage that baking is more of a science than an art and Rose also works to this idea. The book has inspired me to give my cake making another go. However I have the US version of the book. I was going to try to make the All Occassion Downy Yellow Cake but then saw that it needed Cake Flour. This afternoon I looked at Rose’s blog and it mentioned a US and UK version of the book. I’ve looked on Amazon etc to see if I can get a copy of the out of print UK version but don’t see it anywhere. Then by chance I found your blog and the whole discussion re cake flour and the US/UK version of the blook. I think the work you and your other bloggers are doing is fantastic and the cakes look incredible. From what you say it sounds as if I am best to stick with the US version of the book but to try out your “Kate Flour”. I’m a real newbie here and wonder if you could keep me right on how to make Kate Flour. I thought I’d try the Downy Yellow Cake first. For this I need 300g of cake flour. I have only been able to find MacDougall 00 Flour – so if I measure out 3 cups (hope my measuring cups are the right size not sure if they are USA or UK) of flour and then another say half a cup. Put the flour on a microwaveable plate and microwave on high for 6 minutes in total stirring each minute in between. I have an 800W microwave. Then sieve it into a bowl. Then take a level measuring cup of the flour and weigh it. Work out what is 1/8 of this weight and remove that amount of flour and then fill up the rest of the cup with cornflour to level again. If I do this with all the flour I’ve microwaved then put all the flour plus cornflour mix into a bowl and then take from that an amount that weighs 300g… will I then have the cake flour (aka Kate Flour) to make this cake? Rose also mentions baking powders that are US brands and you can’t get here. I can only find Supercook locally – is that what you use and does it make any difference. Do you use any particular butter – is Lurpak unsalted OK.
Are you using magic strips – or have you managed to find a supplier for those new heavenly strip things that Rose has just created and mentions on her website. 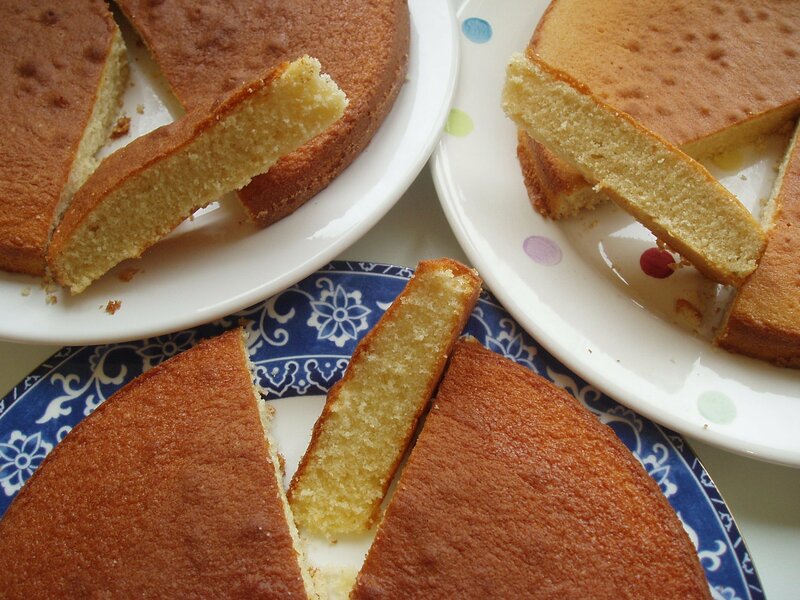 I’m so glad I found your blog this evening – as if not I’d have just tried to make the cake with plain flour, which would have been another leathery disaster and resigned myself to the fact that I just can’t bake! If you could answer these queries I’d be really grateful. I hope you don’t mind me stepping in and asking. I’ve become a Mum for the first time at the grand old age of 40, to twin boys and think that is what has spurred me on to want to be able to bake a decent cake that won’t embarrass them! PS You should go on Dragon’s den with marketing your “Kate Flour” – I bet if the Dragon’s saw your cakes they’d back you!! Hi Janice – I’m pleased that you’re going to give baking another chance 🙂 I hardly baked at all until a few years ago (and my first cakes were disasters, too!). Rose’s All Occasion Downy Yellow Cake is a good place to start. McDougall’s 00 flour works well for this. To get 300g of kate flour, it might be best to make it up in 2 batches (ie. follow steps 1 – 10* twice over, rather than trying to cram too much flour into the microwave in one go). I’m using Fiddes Payne baking powder at the moment, but I’ve also used Supercook and haven’t really noticed any difference. Lurpak unsalted should be fine – I tend to use Tesco’s bog-standard or Country Life unsalted, depending on which I spot first. I have some homemade cake strips that I use when I can get them to stick on the pan! For these, I folded up a long strip of kitchen roll, placed it on top of a a wider strip of kitchen foil and then folded the foil down around the edges to frame the kitchen roll. If you wet these and squeeze out the drips a bit before wrapping them around the pans, they work in the same way as magi-strips (I haven’t had one catch fire yet, but I do hold my breath each time I use them!). And congrats on becoming a Mum. Twins – phew!! They’ll soon be ‘helping’ you in the kitchen, I bet 😉 . Good luck with your cake – do let me know how it turns out 🙂 . Fraid I don’t have a probe thermometer (not yet anyway! )..so will zap the 00 MacD flour for about 4 and a half minutes and see how it goes. I’m having the house renovated at the moment – so hoping I will be recreating the scientific conditions for your successful cakes to the last detail! The joiner is putting the stair in this week so poor soul may end up the guinea pig for the first go at the cake. It must be a good sign – our stairs are going in this next week, too! Hi Kate – Hope your stairs are in – mine are now in and what a joy. It’s great to have got rid of that ladder at long last. Hope your building works are going smoothly. Now onto the serious stuff…cakes! I made Kate flour and then baked the All Occassion Downy Yellow Cake..Success!! The cake tasted great and my joiner said “Wow” when he saw it. I was over the moon – at the age of 40 a cake that was good enough to serve to anyone other than the birds. I then made more Kate flour in just the same way and baked the White Velvet Butter Cake…it was OKish but not nearly as good as the AODYC. Maybe its just the AODYC is a nicer cake anyway. Its my wee boys first birthday this week and I want to bake them a cake….I was thinking of making the Perfect All American Chocolate Cake. I’ve bought my Green and Black’s cocoa to make that cake but I am in two minds about just making another AODYC which I know will be OK. Did the PAACC turn out as good as the AODYC for you? Want something good for their birthday party. Thanks for your help in making me bake a great cake – I’m so glad I stumbled on your blog – you certainly have made my world merrier! I’m so pleased your cakes were successful, Janice! 🙂 Thanks for telling me about them. Hi Kate – the chocolate cake was a huge success – I was so delighted to be able to bake a cake for their birthday that was edible! Thanks for all your help and encouragement and three cheers for your Kate flour! Oh that’s wonderful, Janice! Now … what will you be baking next? (You can’t stop now, you know 😉 ). Hi Kate and a very happy New Baking Year to you! I had a go at your Carrot Cake. It was a big hit…even with my pals that are on diets as they said it tasted very healthy! This is definitely the time of year when you feel like baking when outside is a bit of a no-go due to the weather. Hope your baking and house renovations are both going well. And to you too, Janice 🙂 . Thanks for letting me know about your Carrot Cake – I should make it again myself sometime as it’s about the only cake my husband actually likes! We still have builders (they very much enjoyed the chocolate fudge cake I made the other day …). We’ll miss them when they’ve finished here (who will eat the cakes??). I’ve only ever made biscuits with gluten-free flour (when I was working at Portfield), and I have to say that they were fairly minging. Probably the fault of the recipe .. I think I may have something on cakes with gluten-free flour, but it’s not something I’ve ever tried. I’ll look it up and get back to you 🙂 . Hi Kate! First off, I tried your kate flour formula and it was a success. My cake came out fluffier… I never thought to research the flour here in the UK. You did a great job. Anyway, I don’t know if you’ve noticed a lower protein flour being sold in Waitrose. It’s a French flour called Francine Supreme Superior White Flour with protein at only 8.8% I have yet to give it a go… maybe this weekend. Dear Kate,I found information about your flour some time ago,but its the first time I read that a thermometer is used.Is it the way you make your flour now.I did it as you recommended earlier-3 times,2 min.each.Should I double check with thermometer now?I checked some american recepies,not from Cake Bible.Usually they never work,even pancakes.It seemes that their all-purpose flour absorbes much better liquids and fats. Our german flour has 9.8% protein content,their 11-13.I recently bought a book by T.Boyle and tried 4 choc.cakes-all a complete disaster.If I substituted a few tbsp.of flour with m.w.flour(without cornflour),then the cake “bursted”,as if it contained too much flour.If I just used simple flour,the result was very soggy.At the moment I am trying to find the ways to make my own”american”all-purpose flour.Kate,would you be interested to exchange the results and opinions.Want to say as well,that english baking is a 100%succes in Germany. Just wondering … are you weighing or measuring the flour? I’ve never substituted only a few tablespoons with microwaved flour – it’s been all or nothing – so I’m not sure what results I’d be expecting. Oh, and yes – I tend to use a thermometer all the time now as it means I can microwave in very small bursts so the flour doesn’t burn, but still keep track of how close I am to getting to 130 degrees C.